On 20.02.2019, more than a dozen of representatives from industry, research and administration visited the GeoCentre of Northern Bavaria. The reason for their visit was a workshop on the innovations and main results of the EU-funded research project “Cheap GSHPs”. Dr. David Bertermann and Johannes Müller from the shallow geothermal working group led the workshop, in which guest lectures by Prof. Dr. Ing. Simone Walker-Hertkorn (tewag GmbH) and Mario Psyk and Daniel Gottschalk (REHAU AG + Co) were on the agenda. The organizing team would like to take the opportunity to thank all guests for a successful workshop. 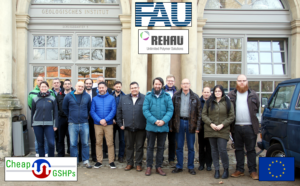 The national workshop of the Cheap-GSHPs project has received funding from the European Union’s Horizon 2020 research and innovation programme under grant agreement No. 657982.